The Hebrew word “nephesh” is for “living being” or “soul.” When God made animals He gave them a “breath of life.” Remarkably the same Hebrew word, “nephesh,” is used for both animals and people. Are we suggesting that they have souls…? No, because only humans are made in the image of God. However, we need to recognize that people and animals do share something unique …they are “living beings” and have same “nephesh,” the “breath of life.” Because, God has a future for both mankind and the earth, we can definitely assume that He has a future plan for animals as well. 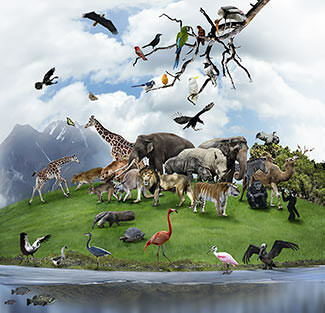 Understanding the importance of animals in God’s creation, and understanding that God created them with a “nephesh,” “the breath of life,” we can then understand the significance in the animal sacrificial system as they were the highest representative role imaginable, symbolizing God’s messianic Redeemer. In the Greek, the word is “zoon,” and it literally means “animal”. The same word, “zoon” is used in various other passages of Scripture to indicate “animals” (Hebrews 13:11; 2 Peter 2:12; Jude 1:10, Genesis 1:21; Ezekiel 47:9). When we grasp that the living creatures in heaven who are crying out “Holy, holy, holy” are animals - living, breathing, intelligent, and articulate animals who dwell in God’s presence and worship and praise Him, then we can start to grasp that animals, indeed, are important to God’s overall plan for a redeemed Earth. If animals praise God in heaven, how much more will we! And, if the thought of animals praising God in heaven is too far of a reach for you, then remember the words of Yeshua (Jesus) in Luke 19:40, in response to people praising Him, “I tell you…if they keep quiet, the stones will cry out.” If a stone can cry out praises to God, we shouldn’t expect that an animal can’t! Eden was perfect and Eden had animals… Without animals, Eden wouldn’t have been Eden. We could expect that the “New Earth” would be just as void without animals. We believe ALL of God’s creation will be represented on the “New Earth.” In Revelation 4:8-9, we’re told that “living creatures” with six wings and covered with eyes - praise God with their voice. They verbalize glory, honour, and thanks to God. The KJV uses the word “beasts” and other translations use “living creatures.” The world of Genesis 1 was orderly and peaceful …and originally there was no struggle for survival, no competition among the species and apparently no predation… “And to every beast of the earth, and every bird of the air, and to everything that creeps on the earth, everything that has breath and life, I have given every green plant for food,” Genesis 1:30. Animals are also prominent in Genesis 2:24-25 where like Adam they are created from the dust as potential helpers for him. 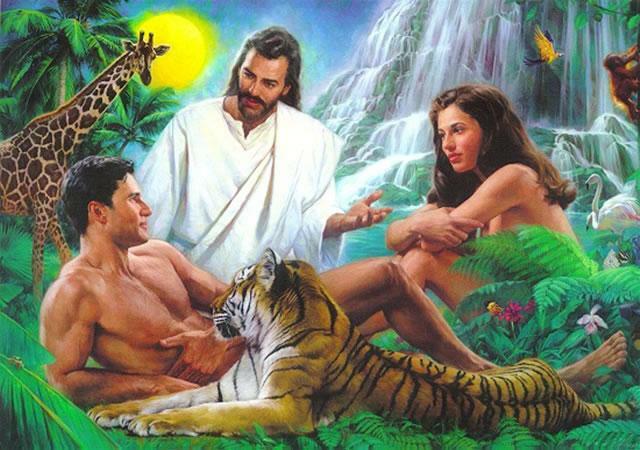 God instructed Adam to name the animals (Genesis 2:19-20) and rule over them. A name is an identity so to name something is to establish a relationship. Adam was NOT instructed to name plants …only his wife and animals. The Bible repeats that Adam is NOT to eat their flesh …but is instead to eat the fruits of the Garden of Eden (Genesis 2:15-17). Only just two chapters later we see that the Biblical narrative takes a sharp dive in Genesis 3, when Adam and Eve who were supposed to take care of Eden and the animals instead “fall” as they disobey God and submit the whole world into a curse! Things get progressively worse until by the time of Noah, the world is so corrupted (much like our world is today) that God regrets ever creating humanity! On the surface the flood story shows God’s mercy to Noah and his family and the animals in the midst of divine judgement! When we read carefully Genesis 6-9 …we can see that it reflects back on creation and the fore-shadow of “a new heavens and a new earth” (Revelation 21:1-2). Notice for instance; how the “flood” imitates the style of Genesis 1 and draws a clear contrast between them! Originally everything in creation was as it should be …“and God saw that it was good” is repeated seven times in Genesis 1 …however on the seventh time; “and God saw everything that He had made, was good!” Then compare that to the beginning of the flood story - Genesis 6:5, “and God saw that the wickedness of humankind was great in the earth, and that every inclination of the thoughts of their hearts was only evil continually.” Again we read in Genesis 6:11-13, “Now the earth was corrupt in God’s sight and the earth was filled with violence. And God saw that the earth was corrupt; for all flesh had corrupted its way upon the earth.” (Much like our day…?) This was a reversal of God’s creation plan for the earth! On the 2nd and 3rd days of creation (Genesis 1:8-10) God separated the waters holding them back with the dome (firmament) of the sky and with dry ground …but once Noah and his family and the animals were safe in the Ark, God allowed the waters to return (Genesis 7:11) and then God created all over again! The waters receded, once again leaving the sky and dry ground. And, just like the first time, God blesses humans, animals and every creeping thing commanding them, “to be fruitful and multiply and fill the earth,” and gives Noah dominion over all the creatures. Finally, God establishes a “New Covenant” with Noah, his future descendants, “and with every living creature that is with you, the birds, the domestic animals, and every animal of the earth with you, as many as came out of the ark,” promising never to curse the ground because of humanity and never to destroy the world again by flood (Genesis 8:16-22; 9:8-17). In effect Noah and the animals entered; "a new heaven and a new earth" …but a world like Eden was diminished! Whereas Adam and Eve were innocent and unashamed of their nakedness, Noah’s family still stained by sin …and Noah’s nakedness was a cause for shame! And, whilst originally there was peace among the animals, the violence that infected the animal kingdom after Adam and Eve’s sin is now present! Moreover, Noah is allowed to eat meat and the fear of humanity now afflicts all of the animals and is still so! At the same time, however, while the flood was a means of destruction and re-creation, notice that it is NOT a complete destruction, NOR a complete re-creation! God could have utterly annihilated the "old creation" and spoken an entirely new world into existence …but instead, God chose to fashion His "new earth" from the remains of the "old one." This point is significantly important because several prophecies use the "flood" as a fore-taste of God’s ultimate plan for the world. In Hosea 2:18, for example; God’s promise to restore Israel echoes the covenant established with Noah. Also compare 2 Peter 3:11-13. According to scripture, then the post-flood world is like Eden, but greatly diminished in contrast to what awaits us in the "new heavens and new earth" …and we can read this in Romans 8:18-25 and Revelation chapters 21 and 22. Like Romans 8 and Revelation 21-22 brings us back to Genesis. John’s description off the "new heavens and new earth" draws from the prophecy of Isaiah (Isaiah 65:17-19, 25) in which God promises to end the futility and misery of the present world, bring joy to His people and dwell with them, and establish peace even among the animals! Revelation 22 makes an explicit connection to Genesis 2. 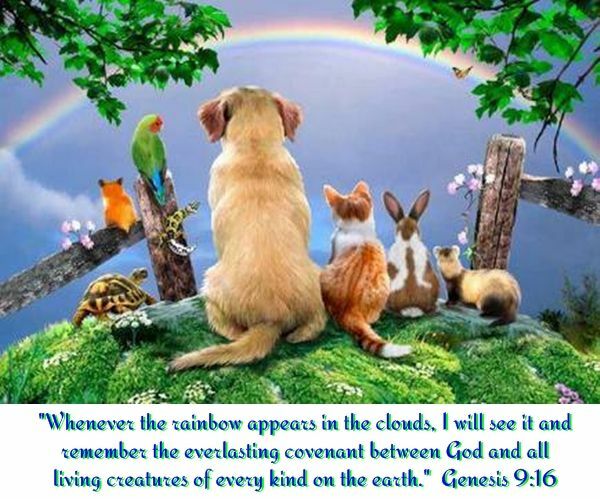 Animals are an essential part of God’s creation… they were important in the flood, the earth and will also be so in the future "new heavens" and "new earth" of Revelation 21-22. From Genesis 1–9, we learn about God’s power and authority and goodness, about humanity’s relationship with God and our place in the hierarchy of creation, and about humanity’s relationship with other living things. Animals are not an after-thought; they are not simply a decoration or addition of an already beautiful creation. Rather, animals are an integral plan for creation and re-creation. Indeed they are so important that God delivered the animals through the flood so that he could use them to re-populate the earth or new world at the time of Noah …and will use them in the next new world… "The wolf and the lamb will feed together, and the lion will eat straw like the ox; and dust will be the food of the snake. They will not hurt nor destroy in all My holy mountain, says Jehovah, "Isaiah 65:25. Notice the reference to the serpent’s deceit in Eden, suggesting that the New Jerusalem will reverse the effects of Adam’s sin. Halleluyah! In Scripture we are shown where animals helped fulfill God’s purposes… the ravens fed Elijah (I Kings 17:4, 6), a fish swallowed Jonah (Jonah 1:17), a fish with a coin in its mouth provided an object lesson for Yeshua’ (Jesus) disciples (Matthew 17:27), Balaam’s donkey refused to walk, thus, saving Balaam’s life, and then talked (Numbers 22). In Exodus 20:9-10, God’s command to mankind to rest included not only humans, but animals too; "…On that day no one in your household may do any kind of work. This includes you, your sons and daughters, your male and female servants, your livestock, and any foreigners living among you." God cares about the well-being of animals… We often quote Matthew 10:29-31 to emphasize God’s concern for humans. Here, Yeshua (Jesus) helped His listeners grasp the extent of God’s concern for them that if God cares about the death of a sparrow, He certainly cares about the needs of humans. That isn’t all we learn from this passage, the Lord also gave us insight into God’s attitude toward animals! Yes it’s true, humans are "more valuable" than a common little bird, but Yeshua didn’t say that animals have NO value to God. In comparison to humans, the little sparrow has little value …but God still values the life of that little sparrow enough to be moved by its death. It isn’t just that God notices the sparrow’s death, like one might notice that the wind is blowing …Yeshua (Jesus) wanted His listeners to understand that God is emotionally invested even in that little sparrow and about what happens to people. God is emotionally invested in birds, animals, as well as humans. The story of Jonah also offers insight into God’s concern for animals. After Jonah preached and the people of Nineveh repented and expressed his displeasure at God’s decision not to send destructive judgment on that people. In confronting Jonah about his hard-hearted attitude …God reminded Jonah that not only has 120,000 people been spared, "many animals" were also spared (Jonah 4:11). The well-being of these animals mattered to God. In addition, Scripture teaches that God is personally involved in feeding the animals and Psalm 104:14; God "causes" the grass to grow for the cattle. The Hebrew text uses the causative form of the verb "to grow" to reveal this. God isn’t simply passively watching nature take care of its own. And, in verse 21 it says that the young lions "seek their food from God." These are examples that the psalmist speaks of animals in general, saying… "They all wait for You (God) to give them their food in due season" (v. 27). 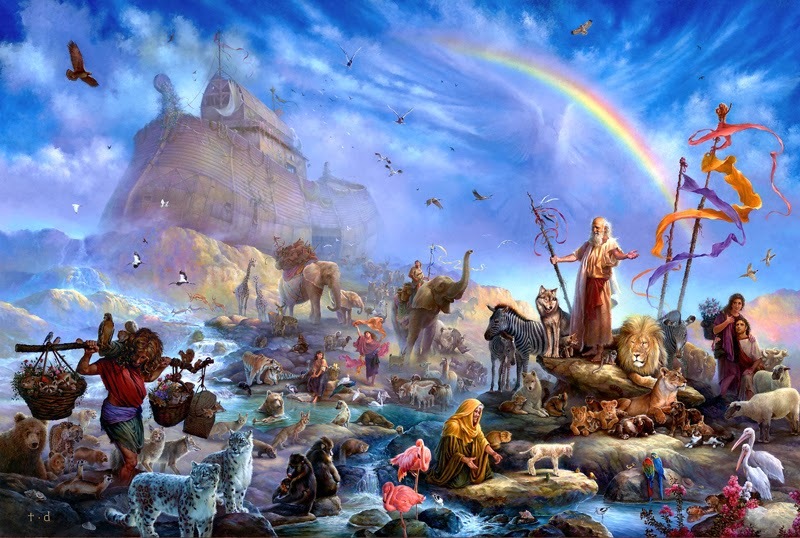 God communicates with animals… This is the best explanation for the migration of the animals to Noah’s ark. In Genesis, God told Noah to build an ark in order to save himself, his family …and shall take male and female, seven of each of the clean and two each of the unclean animals species (Genesis 7:2) …and to carefully preserve them alive in the ark, from the coming flood so that not the least considerable, might entirely perish out of the creation. Even the unclean least valuable animals were preserved alive in the ark. For God's tender mercies are over all his works, and not only over those that are of most use. Yet more of the clean were preserved than of the unclean. However, God didn’t tell Noah to go out and round up the animals. He told him to bring them into the ark (Genesis 6:19), which meant to simply receive them. When it was time for the flood to begin, the text says the animals "…went into the ark to Noah" (Genesis 7:9). The only explanation for the actions of the animals is that God drew them to the ark. God communicated with them directly and they responded. Another example of God communicating with animals can be found in the experience of the prophet Elijah when he fled from Ahab, king of Israel, and went to an area east of the Jordan River. The Bible says God commanded ravens (unclean birds) to bring him food while he was there, and they did (1 Kings 17:4-6). These examples don’t tell us that God is in regular communication with the animals, but they make clear that such communication has occurred. It is certainly plausible that God interacts with animals more than we realize. 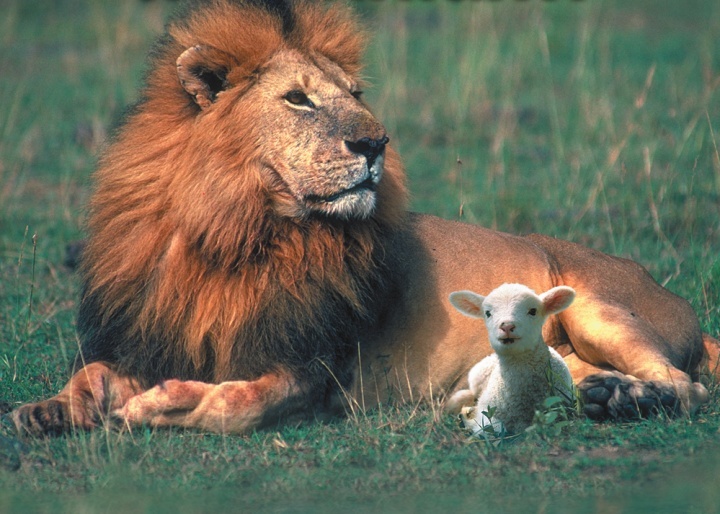 God enjoys animals… Psalm 104, clearly speaks broadly of all that God has created and gives a long description of God’s interaction with animals …wild goats, rock badgers, beasts of the forest, young lions, animals both small and great (v. 18-30). In a few more verses the word translated "glad" is to describe the psalmist joy in God… "I shall be glad in the Lord," Psalm 104:34. It isn’t difficult to fathom that animals bring God joy …when we consider the joy we get from watching animals even those with which we have no creative connection. Given that, it is understandable that the God who created ALL things would enjoy them. Animals reveal God’s sovereignty… Job complained about his misfortunes and God pointed to creation to help Job understand His sovereignty! 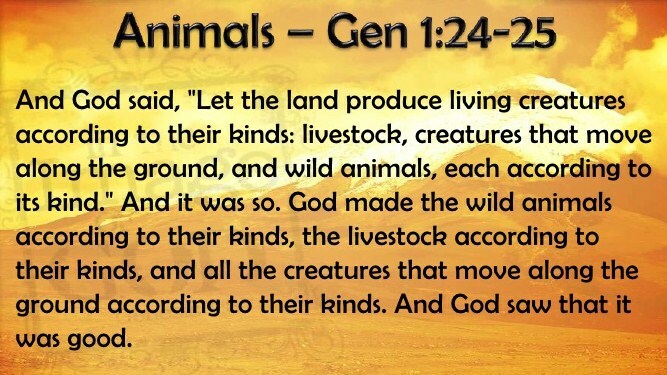 Animals figure prominently in God’s response to Job’s attempted indictment… God reminded Job that it is He who provides for the animals (Job 38:39-41) and appointed them their place in creation (Job 39:6). God also pointed out that He is more powerful than the feared Behemoth and Leviathan by the very fact that He is their creator (Job 40:19; 41:10). While they may be beyond Job’s reach …they are not beyond God’s! In response, Job acknowledged God’s sovereignty. He said, "I take back my words and repent in dust and ashes," Job 42:6. The fact God used examples from the animal world to convince Job of His sovereignty suggests strongly that this is part of God’s intended purpose for His creation of animals. God has built wonder into animals, and by design, they point humanity to him as the great and only sovereign! Animals bring glory and praise to God… In Psalm 148, the psalmist called on everything to praise the Lord and included in this call the sea monsters, beasts, cattle, creeping things and birds (v. 7 and 10). The final verse of the final Psalm reads: "Let everything that has breath praise the Lord. Praise the Lord!" (Psalm 150:6). Even though they don’t do so with words, animals still bring glory and praise to God. By their very existence animals: (1) Point to God as creator. Animals are as much the product of God’s creative energy as any other part of creation. (2) Point to God as love. God loves life so much He creates it in seeming endless variety. (3) Point to God as designer. Animals fill a crucial part of the symbiotic relationship between all of creation. (4) Point to God as artist. Animals are a living display of the natural beauty God has built into creation. Animals are reasoning creatures… Some credit instinct for their decision making skills and believe that animals are "as smart as they need to be" to survive. We believe this is simply not accurate. Animals are smarter than they need to be as they make up for their lack of language by finding other ways through their reasoning abilities to communicate their will. In the Bible, God reveals animal intelligence through the unusual encounter of Balaam with his donkey (Num. 22:21-33). In that incident, the donkey saw the Angel of the Lord standing in the way and moved aside. Balaam became angry with the donkey because it wouldn’t obey him. Yet the Angel of the Lord credited the donkey’s quick thinking for Balaam’s deliverance. He declared, "The donkey saw me and turned aside from me these three times. If she had not turned aside from me, I would surely have killed you," Numbers 22:33. The donkey recognized the danger and made a decision to get out of the way of the Angel …whom Balaam couldn’t even see! Animals don’t need to use tools to eat as they have sources that don’t require the use of tools …but they have the reasoning capacity to know that a tool will help them get food. Also, animals run from danger. How does an animal know it’s in danger…? They can also sense earthquakes; Tsunami’s before they happen. And, dogs are even used in medical situations predicting dangers. Animals must understand something about life in order to seek to protect themselves. We credit reason for human responses to avoiding danger. Why wouldn’t we credit animals with reason when they do the same thing…? We cannot completely eliminate the concept of instinct as we think about animals …but at the same time, we shouldn’t rule out the evidence that animals are also capable of reason. Animals may have a more acute awareness of spiritual reality than we realize… The incident of Balaam and his donkey brings into focus another insight about animals. It reveals that it is possible for animals to see angels (Numbers 22:21-33). 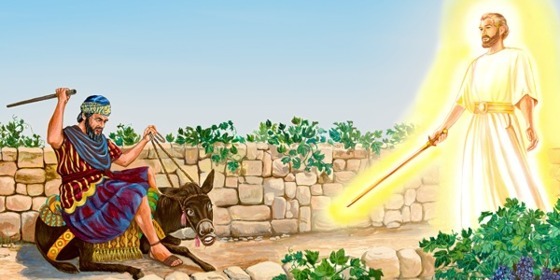 In that incident, Balaam was spared death at the hands of the Angel of the Lord because Balaam’s donkey "turned aside" when it saw the angel and does not say the Angel of the Lord revealed his presence to the donkey. It tells us simply that the donkey saw the Angel. Humans see angels when the angels want to reveal themselves. The donkey saw the Angel of the Lord without his self-revelation and in fact, judging from the Angel’s comments to Balaam (v. 33) the donkey was actually acting contrary to the Angel’s intentions. We could understand it if the Angel said he wanted the donkey to help Balaam avoid the fate he had planned for him. But the text does not say that but suggests that the donkey was actually frustrating the plan of the Angel. The donkey saw the Angel without the Angel’s assistance. This conclusion gains further support when we see that the Lord had to empower the donkey to speak (v. 28). If Moses recognized the need to tell the reader the Lord empowered the donkey to speak, he could just as easily have said the Lord enabled the donkey to see the Angel of the Lord. Yet, he doesn’t tell us that. Animals have the capacity to enjoy life… In Psalm 104, the Psalmist said God formed the sea creature Leviathan "to play" in the sea (v. 26). The Hebrew word translated "play" occurs fairly regularly in Scripture. The psalmist said this beast of the sea can also be ecstatic. The book of Job supplies additional insight. There, God, Himself, described the joy animal’s experience. He mentioned the ostrich flapping its wings "joyously" (Job 39:13), and the beasts of the field "playing" in their surroundings (Job 40:20). This isn’t some foreign concept to us. We have all seen animals playing. The testimony of Scripture and our own experience remind us that animals are more than just driven by instinct. They are beings with the capacity for joy. Animals teach us about the nature of justice… God created them "for their innocence." It is difficult to find a better description of animals than this. Animals appear to lack the capacity for moral reflection. They simply do what they do! Scripture supports this understanding. It was humans who ate from the tree of the knowledge of good and evil, NOT animals (Genesis 3:1-7). This observation of animal innocence is not only important for our understanding of animals but it also helps us understand our sense of justice. When we ask why we are offended by cruelty to animals, we recognize we are reacting to an innate sense within us that is repulsed by these violations of their innocence and vulnerability. Such violations should be punished. Furthermore, we learn about "divine justice" from animals. Israel’s biblically mandated practice in the Old Testament of animals sacrifices for atonement provides this lesson. Scripture teaches that rebellion against God is sin. God’s holiness demands a penalty in response to this rebellion. In other words, God requires justice! Either the guilty person or an acceptable substitute must answer for human sin. God created the sacrificial system in Israel to help His people understand this reality. He commanded that this system regularly kill innocent animals in order to satisfy the demands of His divine justice (Leviticus 16:1-34). The innocent animals would bear the sin of the people. This bloody display served "as a symbol" for what was yet to come …when the innocent Son of God would offer Himself as the true, eternal, substitutionary sacrifice for the sin of all humanity (Romans 3:21-26; 2 Corinthians 5:21; Hebrews 10:1-18). Animals belong to God… Psalm 24:1 states clearly that “The earth is the Lord’s, and all it contains and is repeated regularly in Scripture. While God commanded the first man and woman to “rule over” every living thing (Genesis 1:26), He was not relinquishing ownership of every living thing and did NOT relinquish ownership of anything! (Colossians 1:16; Romans 11:36; Hebrews 2:10) God put the man and the woman in the Garden to “cultivate it and keep it” (Genesis 2:15) and even gave humans authority over it. After the Flood, He gave us ALL of the rest of creation for food... But, NONE of this assignment of authority and power included a transfer of ownership! Humans serve a stewardship role toward creation, not an ownership role (Genesis 2:15). This stewardship pertains to everything and is intended to include an attitude of respect (Leviticus 25:3-5; Numbers 35:33). The animals are subject to humans, but they are not ours to do with as we will …they belong to God (Job 41:11; Psalm 50:10-11). So, will animals inhabit the New Jerusalem and New Earth…? YES! God’s plan for the earth involves animals …so, why would it not involve their restoration as well…? Ponder on this: Adam, Noah, and Yeshua (Jesus) are the three heads of the three earths; when Adam was created, God surrounded him with animals. When Noah was delivered from the Flood, God surrounded him with animals. When Yeshua (Jesus) was born, God surrounded Him with animals and when He establishes the “renewed earth,” with renewed men and women, don’t you think He’ll surround Himself with renewed animals…? Have you ever imagined that in Heaven, animals could talk…? Would it surprise you to learn that in Eden, animals may have communicated with verbal language - speaking where humans could understand…? If this is almost ridiculous to you, consider Genesis 3:1, “Now the serpent was craftier than any of the wild animals the LORD God had made. He said to the woman…” The serpent heard God, understood reason, exercised logic, manipulated, and tempted Eve - the snake was craftier than the other wild animals, suggesting other wild animals had speaking and reasoning skills, as well as a free will. Eve did not react to the fact that the snake talked! Some would say, “Well, Satan just possessed the snake and spoke through it.” But still, if it was unusual for an animal to talk in Eden, why didn’t Eve react strongly, almost in disbelief, as we would if a snake talked to us today…? If Satan used the snake, is it unreasonable the snake had “vocal cords” that could be used…? Consider Balaam’s donkey (Numbers 22) and John says in Revelation 8:13; “I heard an eagle that was flying in midair call out in a loud voice.” And in Revelation 5:13 we read that “every creature” in the universe will sing and give praise to the Lamb! Halleluyah!